Happy Friday! Sorry I've been an absent blogger this week... Instead of spending my evenings in front of the computer, I was snuggled up with Conor, wine, & the final season of Breaking Bad! We're only a few episodes in and I can't wait to see how it ends! This weekend we have a neighborhood BBQ and daylight savings time to look forward to. And if we have enough time, we might go to a home show on Saturday... I just aged at least 10 years with that last sentence; do NOT judge me! As always, thanks to all the lovely hosts: Christina, Darci, April, & Natasha! While watching the Oscars last Sunday, I was ooh & aahhing over many of the dresses! I LOVE myself a plunging neckline; although, I can't exactly pull off that look with a grabby toddler. Nonethless, I was dreaming of my more scantily clad days, and I decided that if I were to pick an Oscars dress, I would be wearing Kate Hudson's. She was stunning! Once again Thrifty Littles pushed me to make another impulse buy! This tee was just too adorable to pass up! I'm pretty sure you can use the coupon code THRIFTYCUB for 15% off your purchase through tomorrow! I know that St. Patrick's Day hasn't even passed us yet, but I'm starting to get excited about Easter! 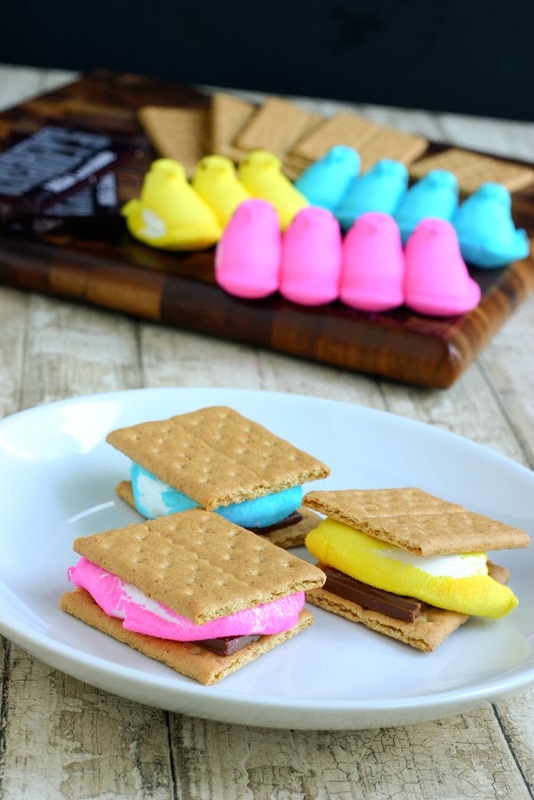 These Peep S'mores will be making an appearance at our house very soon! 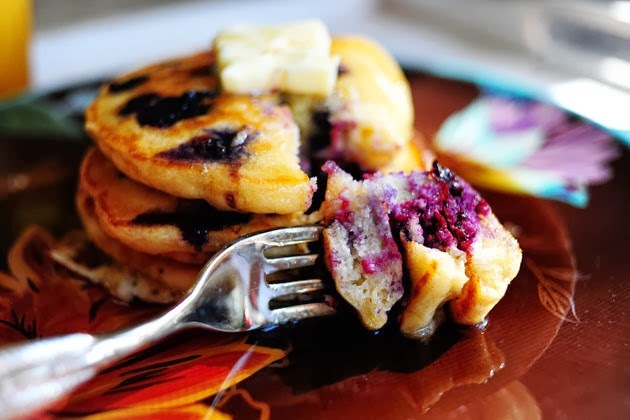 I made these lemon blueberry pancakes last weekend, and they were pretty amazing! That Pioneer Woman knows her stuff! I served them with blueberry syrup instead of maple. Fruit syrup for the win, always! Unless your live in Vermont or Canada, then you are allowed some maple syrup. I also wanted to say (once again) how amazing this blogging community is! I received so much support from my recent postpartum post. It is incredibly encouraging to hear from other women who have struggled with fertility. I appreciate all your comments & emails! Kate Hudson looked AMAZING! I agree with Gogggle +. I actually got off of it because I had no clue how to use it! It seems pretty hard to figure it out! mmmm....making those pancakes this weekend. look delish! i only watch the oscars for fashion - i thought charlize theron's dress was STUNNING, but was reminded of how breathtakingly gorgeous kate hudson is. ahhh to be styled. have a good weekend! I hope you love the pancakes as much as we did! 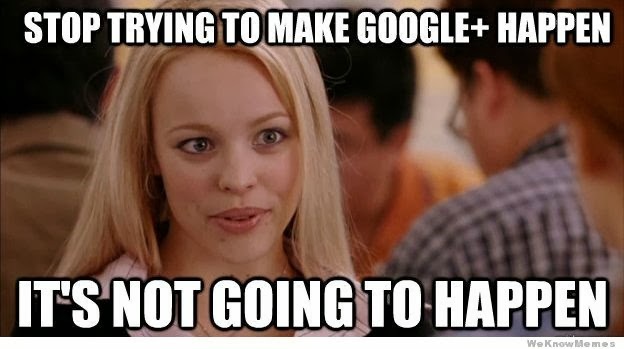 I totally agree on google+ and linkedin. I do use twitter though. The other two just don't make much sense to me! Wishing I could fit in the Home Show too...maybe Sunday?!?!? So excited for the weekend...those pancakes look Ah-mazing!! ...and now I want pancakes. And I agree, Google+ is super confusing....I find linkedin easy though! I laughed about Google+. Seriously! And what a cute t. I'm going to check them out now! They used to have "mama bear" tees too! If they are ever back in stock, I will surely be snatching one up! I can't wait to hear what you think of the ending to Breaking Bad. I just finished last week. Such a great show! I don't understand google+ either but I kinda don't care to, lol. :) And, YES, that is the best I have seen Kate look other than in her movies, of course (hello How to loose a guy in ten days yellow dress). OH. MY. GOSH!!! We have the exact same social media standpoints. I can't figure out (and don't want to figure out) Google plus. Twitter is not my jam. Those pancakes look delicious! I love the Pioneer Woman's recipes! They are pretty easy to make! You should give them a try this weekend!